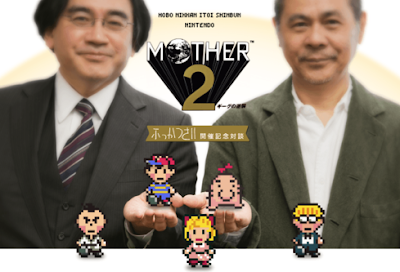 Nintendo's Satoru Iwata and Hobo Nichi's Shigesato Itoi recently sat down--with Itoi's colleague, Nagata--to talk about the making of Mother 2 (EarthBound to those of us in North America). This little tête-à-tête apes the format of Nintendo's wonderfully informative Iwata Asks interviews that I've written about here and there--which is a very good thing indeed. Also a very good thing: for the last few days, the person behind the KameDaniRyuu tumblr has been publishing translated versions of the discussion between Itoi, Iwata and Nagata. My favorite parts of this EarthBound-cenric Q&A include the revelation that Itoi and his team worked on the game for four years before Iwata, head of HAL Laboratory at the time, swooped in and whipped it into shape (it hit the streets a year later) and that Itoi wrote its script by hand with a pencil. To read KameDaniRyuu's translations of this chat, check out the introduction here, part one here, part two here and part three here. I have seen the show, yes, but I wouldn't say I've seen a ton of it or that I watch it regularly, etc. Actually, I believe the Mother 2 episode already aired. In fact, I watched a bit of it yesterday or the day before, I believe. I'll search for a link and post it here if I can find it, OK? I'll wait til it's subbed, half the fun is Arino making jokes, but thanks so much for the link!